Home / Blog / Does Noisy Data Put IATI Users Off? The aid transparency movement has come a long way since the inception of the International Aid Transparency Initiative (IATI) in 2008. There are now over a million activities on IATI and the numbers are growing every day. However, in order for transparency to meet expectations, people have to be able to access and use the data. In this way, open data can help contribute to the increased autonomy of developing countries and their people, a crucial aspect of development itself. That’s why, when Silvia Poggioli, country director of AIFO Liberia, came to us with her experience of using IATI data, we were keen to hear how it went. AIFO Liberia delivers disability-focused programmes in Liberia, and promotes the rights of people with disabilities, aiding their social and economic participation. Additionally, Silvia is chairperson of the Alliance on Disability—a network of local and international NGOs and partners committed to coordinate their actions in pursuit of empowerment and support of people with disabilities. At the moment she is working with the Alliance to plan work for 2019, and raise vital funds to carry out their activities. Silvia turned to IATI in an attempt to find out which donors currently support, or have previously supported disabilities work in Liberia. More specifically, she wanted to know if the donor community in Liberia has an interest in disability issues, which NGOs have been funded to carry out work on disability, and if there are particular thematic or geographical areas that have been supported. Clearly, these are the kind of questions that open aid data should be able to answer. This is just one example of the complexities of using IATI data. During Publish What You Fund’s own attempts to use IATI data as part of a wider study to assess the impact of the US budget proposals, we had the same experience. It seems counter-intuitive to suggest that having all this data is a bad thing. But is this a symptom of there simply being too much of a good thing? Not quite. 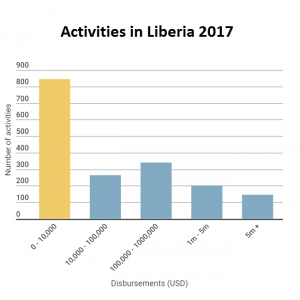 Of the almost 2,000 activities listed for Liberia in 2017, almost half were from activities worth less than $10,000. This is not because small Liberian NGOs are sharing their data, this is because large donors are churning out small transactions as individual activities. We could have selected any of a hundred or more examples but take, for example, this activity by the World Health Organisation. It accounts for just $710, and its explanation is completely incomprehensible. Small transactions such as these sit alongside, for example, this $15 million World Bank activity. As you can see, having these relatively small activities — or extraneous data, posted by large donors clutters up the available data, and makes it very difficult to sort through. The issue here isn’t just that the transactions and activities are small. For example, it wouldn’t be an issue if a small, local NGO was posting activities of only $710. For a smaller organisation, this could be a substantial activity, and it would be important for this to be counted and represented on IATI. The problem, however, is when large organisations ‘dump’ all their transactions as activities onto IATI, with no way to sort through them. As Silvia says, “It just isn’t helpful to receive hundreds or thousands of returns, with no easy way of narrowing your search further.” This extraneous data clutters up the returns of the data, making it essentially impossible for someone to manually sift through. To an extent, this can be mitigated by sector codes. There are certain large sectors, such as health or education, which have their own sector codes. One can sort by sector codes and see all activities in health for a certain year. However, these only go so far. For one thing, there are still significant numbers of extraneous data even once we sort by sector. For another, not all sectors have their own codes. This is the case for disability. “[because] there isn’t a specific sector code for disability…I had to investigate other options – funding for governance, human rights, and civil society organisations – and then see if any of these funds were for work on disability issues. This has been a challenge.” Clearly, tasks like Silvia’s are made nearly impossible by this noisy data.